I originally found this recipe in Jack Bishop's A Year in a Vegetarian Kitchen, which is probably the most-used cookbook in our house. My hubb and I have tried many different ways of cooking stovetop tofu (amazingly enough we've never baked it! I know!) and were never happy with the texture. We love the feel and taste of the tofu from our local Chinese restaurant but I just know its deep-fried, which I refuse to do. So I was really excited when I flipped through the Winter section of Jack Bishop's lovely book and found several tofu recipes, all using this method, with Jack claiming that it was the best tofu he'd ever cooked. We tried it, and had to agree. And for a bonus, its really quick! I can have tofu prepared and on our plates 25 minutes after removing it from its packaging. Gotta love that. *The liquid can be water, soy sauce, balsamic vinegar, broth, orange juice, or any combination of the above. * For the syrup I've used both honey and maple syrup - both turn out well. I use firm or extra firm tofu for this recipe. I think that extra firm comes out the best, with a firm but silky texture inside and glazed crispiness on the outside. 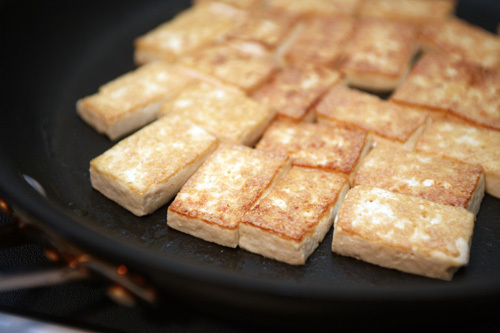 Cut tofu into 1/2" thick slabs. Size can vary, but thickness should always be around 1/2". Any thinner and it gets tough. Place tofu pieces on 3 layers of paper towels. Put 3 more paper towels across the top and press down on tofu firmly with the palm of your hand, until paper towels are saturated. Repeat once more. Heat 1 tbsp oil on medium heat in non-stick skillet. 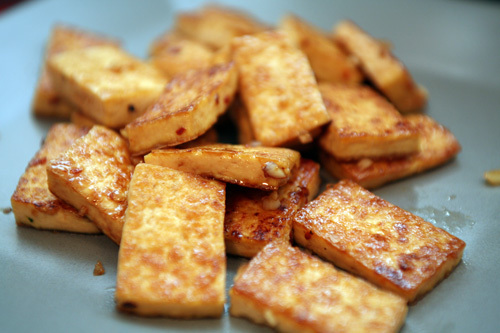 When oil is hot, place tofu in pan. You may need to do two batches if your pan isn't big enough to fit all of the tofu. This is the hardest part...LEAVE IT ALONE! Don't touch the tofu for 5-6 minutes. No stirring, no pan shaking, no flipping. Just let it sit and sizzle. After 5-6 minutes, check the bottom of the tofu for color. Once it is a beautiful golden brown, flip it. And again, LEAVE IT ALONE! Let it sizzle on the second side for an additional 5-6 minutes, until golden brown. Meanwhile, mix all of your glaze ingredients together. When tofu is golden on both sides, pour glaze over tofu into pan. 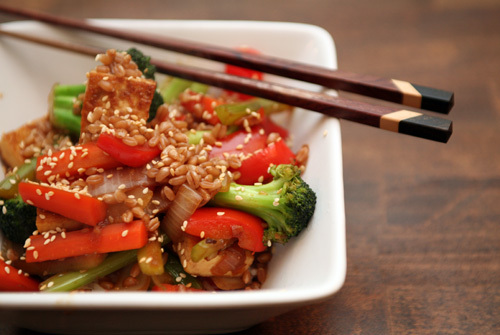 Now you can stir, coating the tofu with the glaze. Let simmer for 3-4 minutes, stirring occasionally, until all liquid as evaporated and the glaze has thickened. 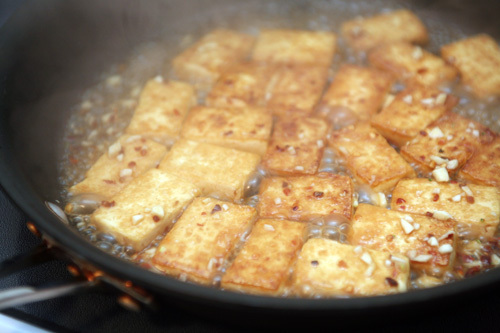 Remove from pan and serve, pouring leftover glaze in pan over the tofu. If I'm using the tofu in a stir fry with veggies, I cook the tofu first, remove from pan, cook the veggies in pan, then add the tofu back in when the veggies are tender along with a sauce of some sort.